Our family loves traveling and if we could – we would do so full time. But as most people find, going on the road or on vacation can be a lot of work before you actually get to the fun parts. 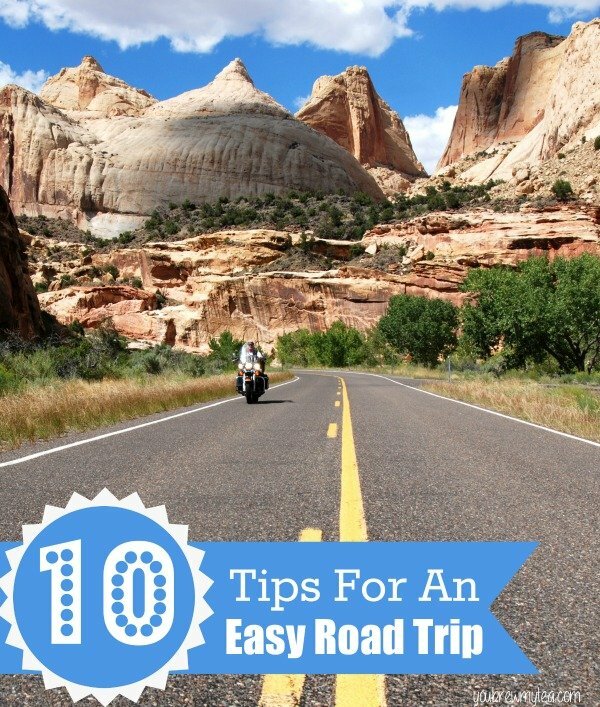 I’ve compiled a list of tips for an easy road trip that will help make you next vacation smooth and easy! Keep in mind this list is for our family which includes children. If you are single or a couple with no small children this list may vary for you. We’ve included things that come in handy, things that are great for emergencies and things that are just fun to have along! (1) Allow yourself at minimum 1 extra day in your travel plans between the time you leave and have to be back home for work or commitment purposes. Having a buffer of time allows you to relax and not stress if your schedule goes awry. (2) Set aside the budget to take your vehicle in for a maintenance checkup at least a week before you plan to leave. This could include an oil change, filter changes, tire rotation and/or a nice full detail. Knowing everything is up to standard before you leave is a stress reliever and a great preventative measure. (3) Prepare Quiet Bags for kids on the trip. Adapt what is included according to their ages. Our 5 year old enjoys small activity pads to color, magnetic puzzles, books and his handheld gaming system. A good pair of headphones is a plus as well. (4) Pack the trunk with a box that includes: Paper Towels, All Purpose Cleaner, Hand Sanitizer, Trash Bags, Toilet Paper, a few lightweight blankets. These come in handy should someone get sick or have an accident on the road, if your hotel room is chilly or not as clean as you expected or for those “you never know” moments. (5) Bring easy to eat and healthy snacks. Keep a box or bag packed with disposable plates and bowls along with a handful of easy and healthy snacks that don’t require refrigeration. Trail mix, chips, crackers, beef jerky, fruit snacks and fresh fruit. If room allows bring along a cooler with soft drinks, juice and bottled water (we also keep flavor packs for the water in our dry box). This saves money and time when kids are hungry on the road. (6) MAP IT OUT! I cannot stress enough how important it is to not only have a map to your destination, but side maps for rest stops, restaurants and places like discount or dollar stores for last minute pit stops. Being prepared and knowing where gas stations are every 100 miles is worth the time when you have a kid in tow. If you have a Smart phone download the free Google Map app and utilize the navigation tool. It’s just like other GPS systems and will direct you vocally to your next stop. Even if you have a GPS system, never leave home without a printed map in hand. A road atlas, state maps or printed off the Internet are great to fall back on. (7) Have duplicate copies of reservations information and maps in your bag with you in the front of car as well as a copy in your luggage. Additionally, make sure you have them saved within your email or an online account like Dropbox should something happen to your paper copies. (8) Plan ahead with prepaid credit cards or gift cards. Don’t carry all of your eggs in one basket. If you are thousands of miles away from home with only you bank debit/credit card and no alternative you put yourself in a place of possibly being stuck without funds should loss or theft happen. Pick up a cheap “green dot” card at the local Walmart for yourself and your spouse. Load $100 on each. Pack them in your bag, in the glove box or on your person separate from your wallet. This ensures you have funds to buy gas, food, etc. should something happen to your wallet while traveling. (9) Pack comfortable shoes and clothing. We all like to look nice but if you are miserable trying to break in a new pair of sandals on vacation it isn’t worth it. Pack what you know is comfortable. This is about fun not fashion! (10) Remind yourself daily that the reason for the vacation is to enjoy your family (or friends) and to relax. Don’t stress the small things. Take things in stride. Check out our other great travel tips!